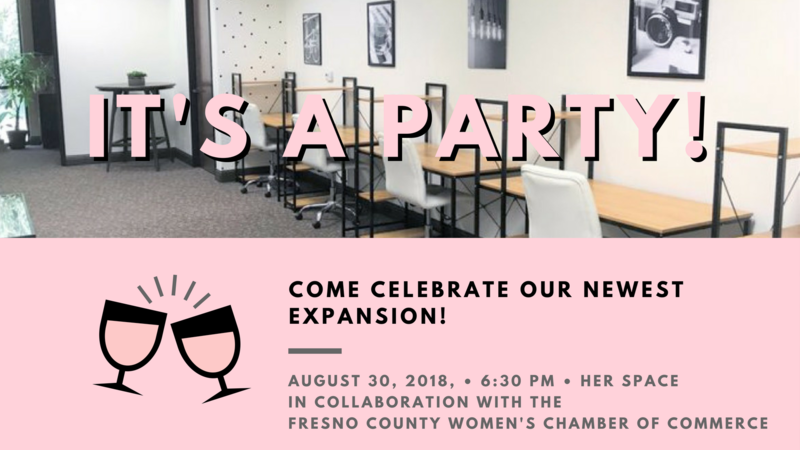 Fresno County Women's Chamber of Commerce - Ribbon Cutting & Expansion Party for Her Space! Ribbon Cutting & Expansion Party for Her Space! Celebrate with fellow FCWCC Member, Her Space, to formally announce their new expansion! Free event and open to the public, everyone is welcome. This new area of Her Space is home to nine dedicated desks and four private offices. Event starts at 6:30pm. The ribbon cutting will take place promptly at 7:00pm - be there on time to get in the picture!